One of the highlights of a visit to the historic monuments of Luxor, ancient Thebes, is the famed Sound & Light Show in the great temple complex of Karnak. As visitors arrive after sunset at the first pylon and walk through the magnificent hypostyle hall, they are treated to the first part of this spectacular show of music, historical narration, and lights and images played on the ancient walls. The experience continues as they reach their seats and view the culmination of the spectacle on the ancient stones across the sacred lake. 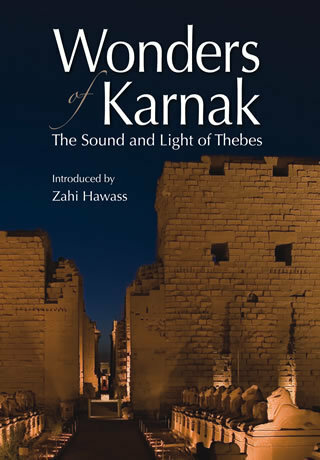 This new, full-color presentation serves as the ideal record—or foretaste—of the Karnak Sound & Light experience, with a historical introduction to the area and the temples by internationally renowned Egyptologist Zahi Hawass, and the complete script of the show, accompanied by over 60 beautiful photographs of the light show and of Karnak Temple and other sights of Luxor.